Nel 1991 comincia a fare l'MC nel legendario Dub Club di Londra, consolidando la sua reputazione di MC e cantante potente ed eclettico. Brother Culture ha lavorato anche con gente del calibro di: Wackies, Mungos Hi-Fi, Zion Train, Mad Professor, Adrian Sherwood, Evidence Music, Manasseh, Youth, The Prodigy e tanti altri! Alcuni dei suoi lavori da evidenziare sono sicuramente: The Prodigy (« Thunder » from the album « Invaders Must Die »), All A We - Roots Garden, Soundsystem - Reggae Roast e Heartical Connection con Paul Fox. Brother Culture è membro del Reggae Roast Soundsystem che performa mensilmente la Brixton Jamm di Londra. E' anche membro di un nuovo "super gruppo" chiamato Digital Messiahs insieme a: Colourman, Donovan Kingjay and Vibration Lab, il loro LP di debutto uscira' presto! In 1991 started to MC at London's now legendary Dub Club, where he forged a reputation for being a powerful and diverse MC and singer. In the subsequent years, has become one of the busiest Reggae artists in the world! He has done shows in most countries, many times being the first Reggae artist to ever perform there. Brother Culture also has worked with the likes of: Wackies, Mungos Hi-Fi, Zion Train, Mad Professor, Adrian Sherwood, Evidence Music, Manasseh, Youth, The Prodigy and many more! Some of the highlights have been: The Prodigy (« Thunder » from the album « Invaders Must Die »), All A We - Roots Garden, Soundsystem - Reggae Roast and Heartical Connection with Paul Fox. 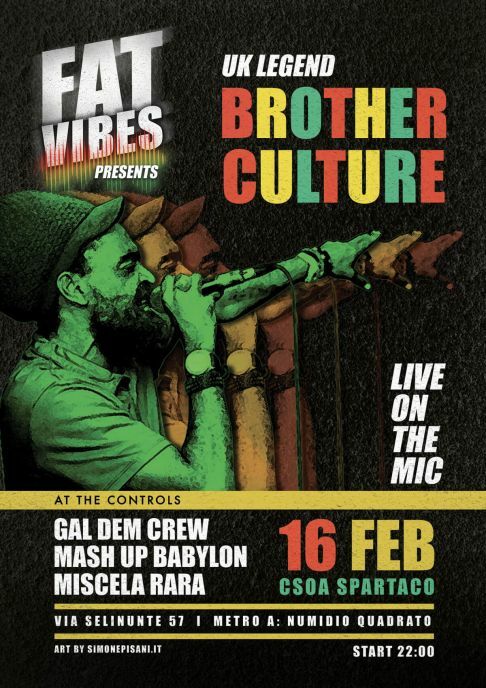 Brother Culture is part of the Reggae Roast Soundsystem, which has a monthly residency at Brixton Jamm in London, UK. He is also a member of a new "super group" called Digital Messiahs featuring: Brother Culture, Colourman, Donovan Kingjay and Vibration Lab, with their debut LP soon to be released!